What makes LASERTRON a Dramatically better choice? All four of the above are critical to providing your customers with a LASERTRON Game Experience that is dramatically better than all the rest. Without the first three, the fourth one is basically useless. LASERTRON has and will always be 100% committed to accomplishing ALL FOUR! We work every day to make sure our LT-12.5 Game System is the best. The most common failure point for other laser tag systems is their phaser cord. The typical phaser cord fails too often and too soon. LASERTRON is the only company that offers a Lifetime Warranty on phaser cords. The reason we can do this is very simple. Our phaser cords last for 10+ years, not months. Why is it so important to have an extremely reliable phaser cord? It is the most critical connection between the phaser and vest. When a wire or connector starts to fail in a phaser cord assembly, it doesn’t just break. The first thing that happens is you get an intermittent connection, which means sometimes the phaser works and sometimes it doesn’t. Unfortunately, it is the customer who experiences the glitches and it’s usually not just one customer. The more frequently a phaser cord design fails the more often your customers will get a mediocre to bad experience. With a LASERTRON phaser cord, you dramatically reduce the possibility your customer will experience an intermittent phaser cord issue. The design of our phaser cord is a perfect example of what makes our LASERTRON LT-12.5 system a dramatically better choice. We are also the ONLY Arena supplier in the laser tag industry who provides a Lifetime warranty on all our arena components. It’s easy to offer a Lifetime warranty, because our plastic arena components are designed to be extremely durable. Our arena warranty costs are virtually zero every year. We also provide a 3-year warranty on all our LED lighting. No other arena supplier comes close to the durability and warranty of our arenas. Our LASERTRON game computer as well as our Point of Sale software utilizes the Linux operating system. Linux is the most reliable and secure operating system on the market today. Here’s a brief sampling of companies and organizations that utilize the Linux operating system to develop and operate their most critical software applications: Google, Facebook, IBM, Amazon, New York Stock Exchange, Cisco, Facebook, FAA, and the US Department of Defense. Linux is a highly stable and robust operating system. If high reliability is the goal, it’s the only choice. Our service and support team will always be there to support your laser tag operation. LASERTRON is known for always being there to help you maintain your system and make sure you get the parts you need when you need them. Our turnaround time on needed parts, supplies, and repairs is two days or less over 95% of the time. We know how important your laser tag operation is and that’s why we constantly track our ability to provide you with the fastest service. One of the key things we spend a lot of time on is creating the best playing experiences for the customers who actually play the game. Too often manufacturers add options that only sound cool on the trade show floor or over the phone. These unnecessary bells and whistles either fail to improve the game dynamics or even worse they detract from the overall playing experience. We develop games that create strategic, evolving game play with irresistible & unpredictable game events. We also provide continuous player feedback and recognition. At our own centers we play multiple games within a session. Multiple games within a session accelerate player improvement. We focus on developing the best two-team games. Two-team games work the best to maximize player interaction and especially player socialization. One of the most unique game features of our LASERTRON LT-12.5 Game System is our Pick Your Own Power-Ups. These Power-Ups can be selected at anytime and anywhere in our arena. This feature alone dramatically enhances the dynamics of game play and takes it to a whole new level. Ability to deactivate your opponents vest with a single tag. Tagging an opponent once with deactivator will require your opponent to return to the energizer. Ability to energize your teams vest with a single tag. This is the only time in LASERTRON where it's to your advantage to tag your own team members. The Energizer player acts just like a mobile recharging unit. Impervious to all tags until you fire your phaser or the mode expires. Exiting this mode will leave your vest fully energized. Stealth allows a laser tag player to sneak around the arena to the best location. Ability to fire your phaser at incredible speeds. Everybody loves rapid fire in laser tag and the Super Rapid Fire mode is rapid fire on steroids. Ability to disable your opponent's vest with a freeze ray that leaves them frozen for five seconds. Frozen laser tag players cannot fire their phaser, but they can still be tagged. Impervious to all tags for a set time period. Invincible is one of the most powerful modes. Impervious to all tags when you are not firing your phaser. Force-Field players drop their force field and can be tagged whenever they fire their phaser. Ability to deflect all incoming laser tag pulses to the player that was attempting to tag you. When multiple modes are activated, deflector players can deflect mode tags like deactivator and energizer, too. Ability to infect and disable your opponents vest with a single tag. Laser tag players infected by the virus must recharge. Ability to change your team colors and infiltrate the opposing team. Spies flash their true team colors for a split second when shooting. Laser tag players on the spy's own team cannot tag the spy. Turns pack lights off so opposing players can't easily see or identify the invisible laser tag player. The player's lights will flash when they fire their phaser. Ability to increase the points scored from any tag. Bonus players receive a bonus score for all bases and opposing players they tag. LASERTRON’s LED Illuminated Wall Lighting can change colors, pulse, flash, strobe, and react to game play events going on in the arena such as Team in the lead. LED lighting can also be adjusted to be brighter or dimmer depending on your preferences or even the age range of the players in the arena. When you buy a minimum 30 Player Game System and a 4,500 sq.ft. LED illuminated Arena we will double the warranty on your LASERTRON game system. When you buy a minimum of 30 Player Game System and a 4,500 sq.ft. LED Arena, your center will receive an 8-Year Radius Protection. You will be the only operator in your area who can operate a LASERTRON game system and LASERTRON LED illuminated Arena. With a LASERTRON Radius Protection, you are guaranteed to stand out from all the rest in your market area. Ongoing learning for existing owners, managers, and prospective operators. A fun and competitive two-team game that’s a combination of lacrosse and basketball played on highly maneuverable Cyber Cars. Patent protected features with radius protection. Buy one or more courts and your LASERTRON and Arena Radius Protection increases to 10 years. Firestone Financial has worked with many of our clients over the years. It is a quick, seamless process that gives you the ability to put down a minimum deposit and have affordable monthly payments. Our contact at Firestone is Spencer Norton. Spencer can be reached at (781) 696-0966 or snorton@firestonefinancial.com. Live Oak Bank and LASERTRON have also worked together on several projects for our clients. Live Oak is the second largest provider of SBA Loans in North America. Our contact at Live Oak is Mike Cairns and he can be reached at (910) 550-2915 or mike.cairns@liveoakbank.com. 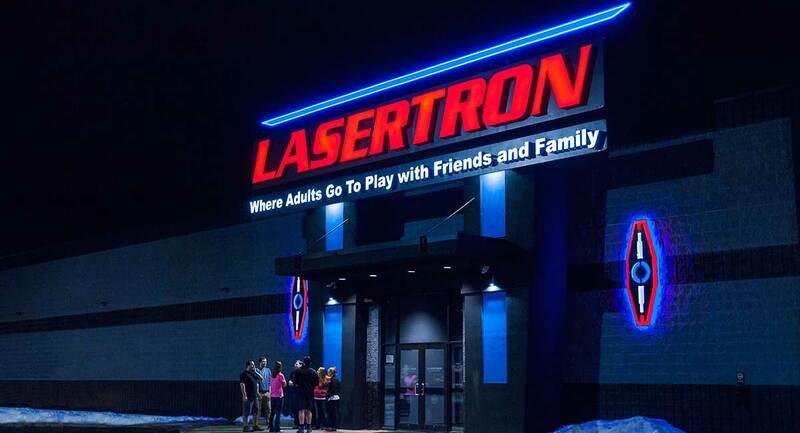 Please call Ann or Greg to schedule your LASERTRON visit today.